Despite deep concerns that America is increasingly divided along racial, ethnic and economic lines, there are some neighborhoods that have a diverse array of residents from different racial and ethnic groups and different economic strata. We know that segregation is devastating for the life prospects of kids growing up in segregated low income neighborhoods, and that socioeconomic mixing has been shown to reduce intergenerational poverty. As we explained in our recent report-–America’s Most Diverse, Mixed Income Neighborhoods–-nearly seven million Americans live in one of the neighborhoods we’ve identified as America’s most racially and ethnically diverse and mixed income. While we’ve got copious amounts of data, and maps showing where these neighborhoods are located, what does a diverse, mixed income neighborhood look like at ground level? To answer that question, we’ve profiled a handful of the 1,300 neighborhoods nationally that scored highest on our two measures of integration: the racial and ethnic diversity index and the income diversity index. The neighborhoods selected score in the top 20 percent of all urban neighborhoods in the US on each of these measures. One of these highly diverse, mixed income neighborhoods is Corktown, in Detroit. A Corktown Landmark: Michigan Central Station (2010) Flickr User Thomas Hawk. Corktown is one of Detroit’s oldest neighborhoods. It’s located just southwest of the city’s downtown, and draws its name from the Irish immigrants who populated the area in the late 19th and early 20th centuries. The neighborhood was home to some of the city’s most famous landmarks, the old Tiger stadium (since demolished) and the now vacant Michigan Central Station (pictured above). 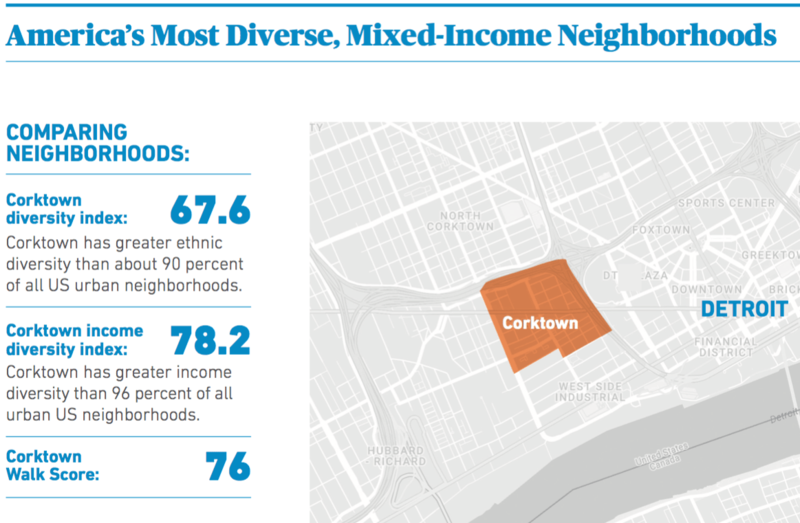 Corktown’s census tract (5214) is one of the most diverse, mixed-income tracts in the US, ranking in the top 10 percent of all tracts nationally in measured racial/ethnic diversity and top 5 percent in income diversity. The neighborhood is 38 percent white, 33 percent black, and 26 percent Latino, with the remainder Asian, mixed race or other. Nearly equal segments of its population are in each of the five income categories we examined. At first glance, it may seem odd to characterize Corktown as a diverse neighborhood. By comparison to the rest of the City of Detroit, the area has a large share of white residents, and it’s become something of a habit for people to use the term “diverse” as a synonym for people of color. Our analysis uses “diversity” in its literal and statistical sense: is there a mix of people from different races and ethnicities. 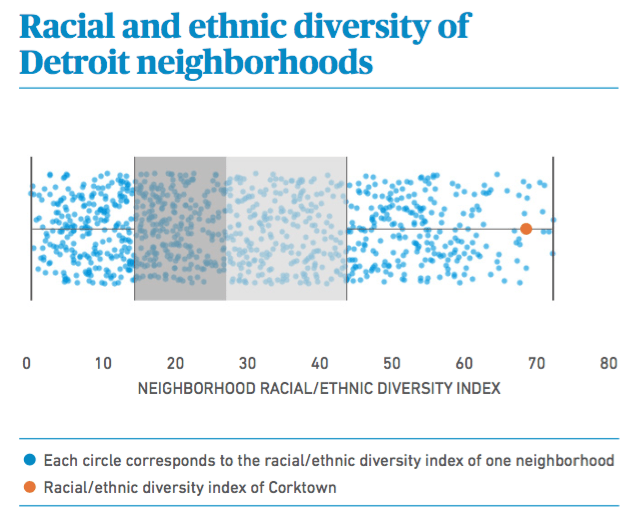 And clearly Corktown is much more racially and ethnically diverse than the typical Detroit neighborhood. Here’s a scatter-diagram that shows the racial and ethnic diversity index for all of the neighborhoods (census tracts) in metropolitan Detroit. Higher values of the racial/ethnic diversity index correspond to greater diversity. In this diagram, each dot represents a single neighborhood. The light and dark shaded rectangles correspond to the two middle quartiles of the racial and ethnic diversity distribution: half of all neighborhoods fall into this range, and the midpoint between the two rectangles shows the median value for the metropolitan area. On this chart, the highlighted orange dot shows the racial and ethnic diversity of Corktown compared to all of the other neighborhoods in the Detroit metropolitan area. This index measures how mixed an area’s residents are by race and ethnicity, and can be thought of as representing the probability than any two randomly selected neighborhood residents would be from different racial/ethnic categories. For metro Detroit as a whole, in the median neighborhood, there’s less than a 30 percent chance than two randomly selected residents would be from different racial/ethnic groups; in Corktown that probability is 68 percent–higher than in more than 90 percent of all of the neighborhoods in Metro Detroit–and as we’ve noted, a level that makes it one of the most racially and ethnically diverse neighborhoods in the United States. It’s a seeming paradox that an area thought of as gentrifying turns out to the statistically the most diverse place in the city. But at the moment, Corktown has a very wide mix of incomes among its residents, and a similarly wide mix of races and ethnicities. As we’ve argued elsewhere, the concern about gentrification is often greatest in those places where people from visibly different socioeconomic groups live close together. The big question for Corktown–and other neighborhoods experiencing revitalization–is whether they can retain their diverse mix of residents as they revitalize. 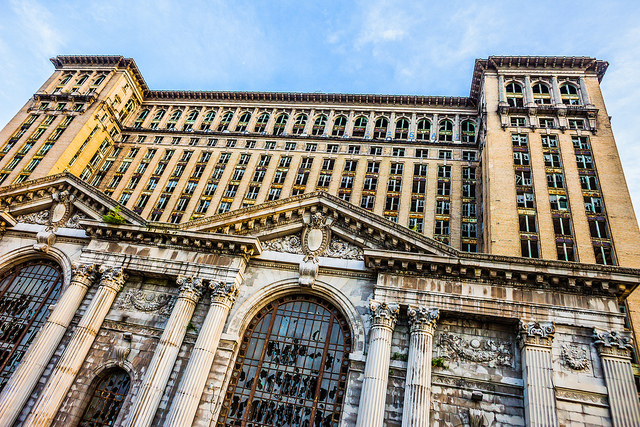 Corktown is on the cusp of change; the old Michigan Central Station is scheduled to be rehabilitated for use as an office for Ford Motor Company. While we tend to view neighborhood’s tipping from one racial group to another as inevitable–based on the history of the 1960s–more recently it has been the case that once neighborhoods become racially diverse, they tend to stay that way. In Corktown, and elsewhere, much will depend on public policies that work to retain affordable housing as the neighborhood grows. We’ve compiled similar profiles of selected neighborhoods in other metropolitan areas around the country. For example, you can explore the demographics of the St. Mary’s Park neighborhood in San Francisco, the Near South Side in Chicago, and Hillside, Queens. We’ve also prepared profiles of neighborhoods in Philadelphia, Memphis and Akron. It turns out that almost every large metropolitan area has at least one, and many time a handful of neighborhoods like Corktown, that embody high levels of both racial/ethnic and income diversity. Seeing where socioeconomic mixing is happening in your area may be one key to fashioning policies that support greater integration everywhere.